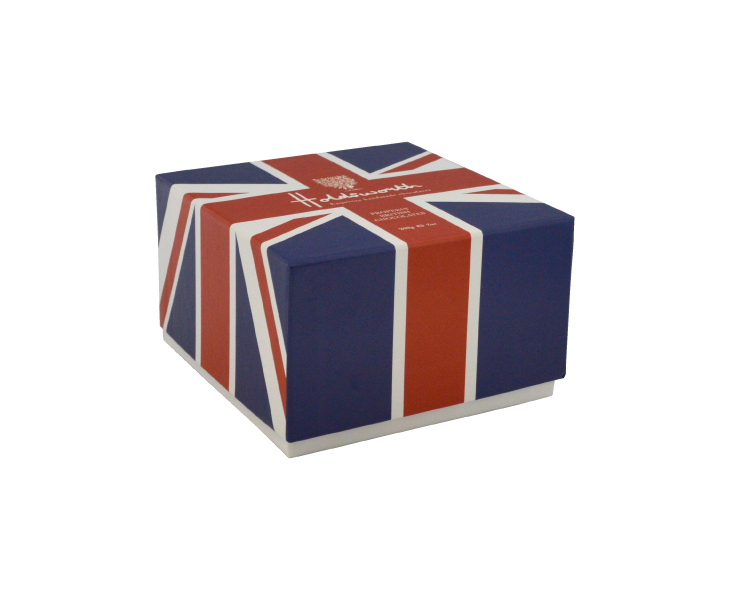 The Union Jack box of Properly British Chocolates is our Theobroma Collection in patriotic clothing. A showcase of all our most popular chocolates in one irresistible box. Handmade milk, dark and white chocolates, confections made to melt in your mouth. smooth Milk Hazelnut Praline, seductive Crème de Cacao Truffle and many more. 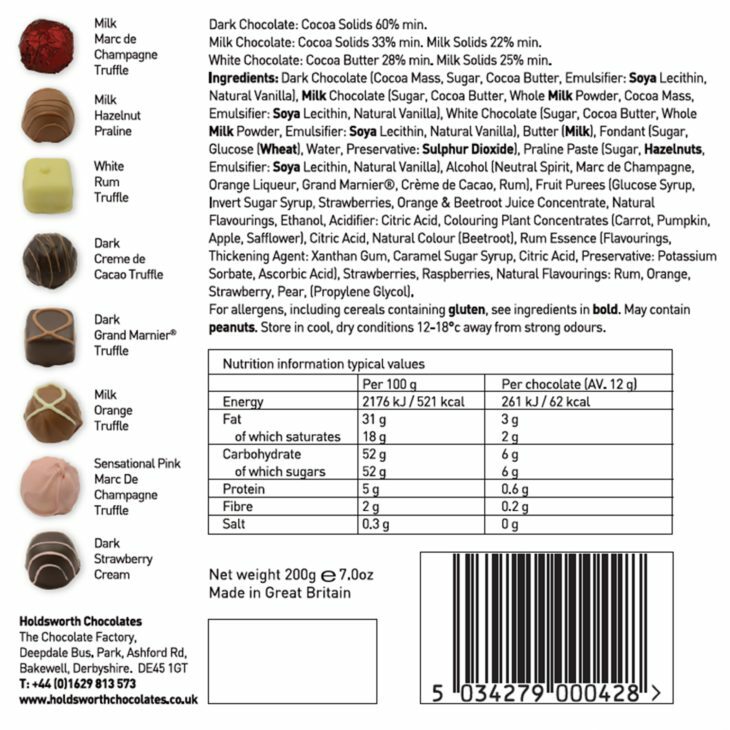 Ingredients: Dark Chocolate (Cocoa Mass, Sugar, Cocoa Butter, Emulsifier: Soya Lecithin, Natural Vanilla), Milk Chocolate (Sugar, Cocoa Butter, Whole Milk Powder, Cocoa Mass, Emulsifier: Soya Lecithin, Natural Vanilla), White Chocolate (Sugar, Cocoa Butter, Whole Milk Powder, Emulsifier: Soya Lecithin, Natural Vanilla), Butter (Milk), Fondant (Sugar, Glucose (Wheat), Water, Preservative: Sulphur Dioxide), Praline Paste (Sugar, Hazelnuts, Emulsifier: Soya Lecithin, Natural Vanilla), Alcohol (Neutral Spirit, Marc de Champagne, Orange Liqueur, Grand Marnier®, Crème de Cacao, Rum), Fruit Purees (Glucose Syrup, Invert Sugar Syrup, Strawberries, Orange & Beetroot Juice Concentrate, Natural Flavourings, Ethanol, Acidifier: Citric Acid, Colouring Plant Concentrates (Carrot, Pumpkin, Apple, Safflower), Citric Acid, Natural Colour (Beetroot), Rum Essence (Flavourings, Thickening Agent: Xanthan Gum, Caramel Sugar Syrup, Citric Acid, Preservative: Potassium Sorbate, Ascorbic Acid), Strawberries, Raspberries, Natural Flavourings: Rum, Orange, Strawberry, Pear, (Propylene Glycol). 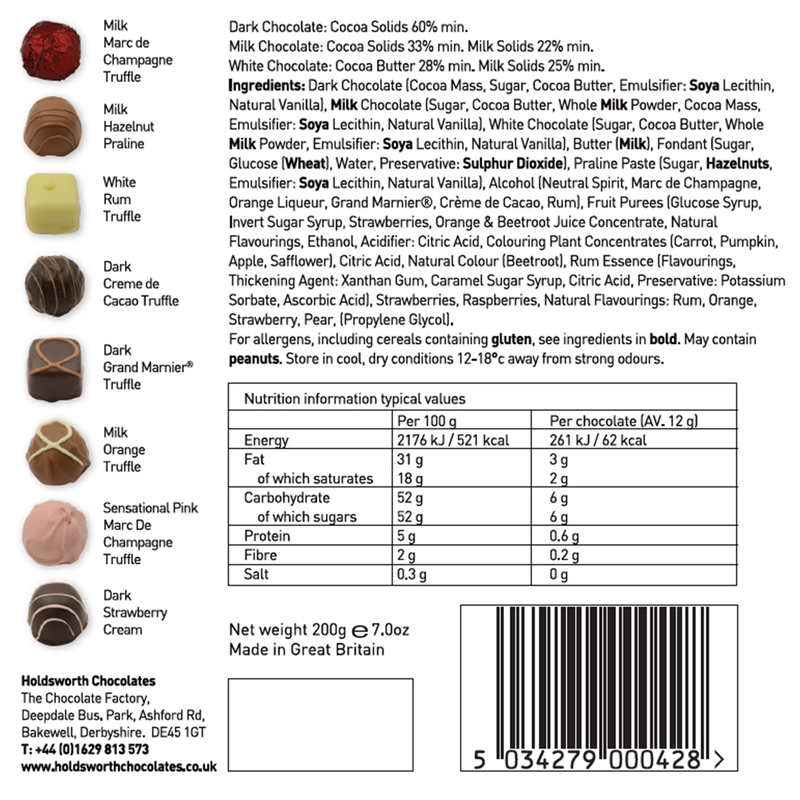 Best Chocolates my wife and I have tasted – all and every one! Best chocolates I have ever tasted and I live in Switzerland!!!! What a wonderful box of chocolates! Not one that was disappointing and I don’t usually like strawberry or orange flavour. 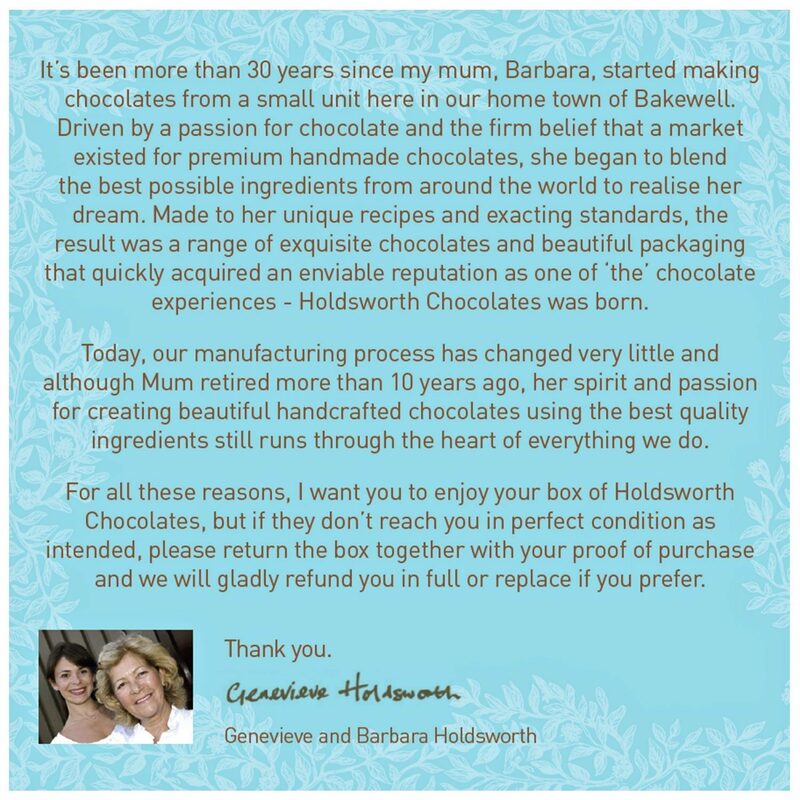 Hi Sandra, Thank you for taking the time to review our product. 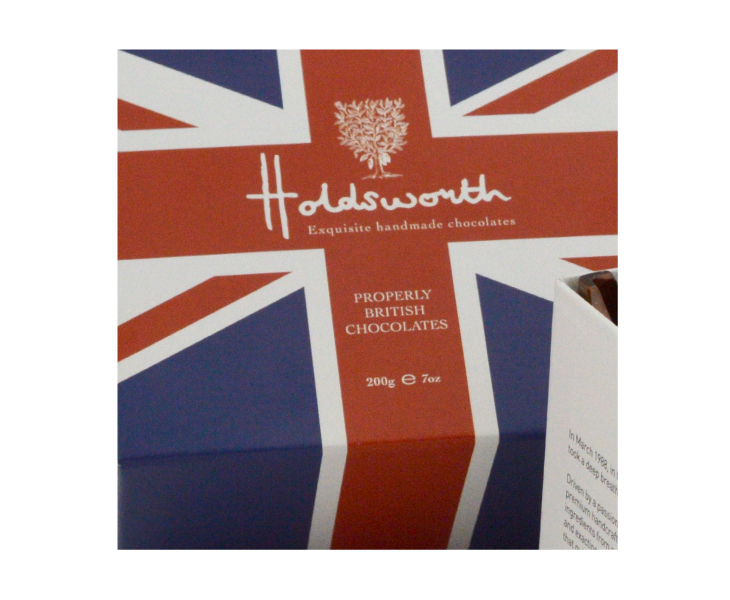 We’re pleased to know you have enjoyed our Chocolates – a lot of time and care goes into making them. We are a small family run business, we appreciate all the amazing feedback. We try our best to give you the best Handmade chocolate experience!